You may have, in passing, heard the term periodontitis or its older name pyorrhea. You know it has something to do with your gums and teeth, but you aren’t exactly sure what it means. Is it bad? What are the causes of pyorrhea? Does it mean all of your teeth will fall out? If you have it, are there any home remedies for pyorrhea? Well, wonder no longer. Think of this as your beginner’s guide to periodontitis (pyorrhea). We’ll take a look at pyorrhea symptoms as well as pyorrhea causes and the home remedies for pyorrhea that may be effective for cleaning up the mouth disease. Periodontitis (Pyorrhea) is commonly diagnosed at dental checkups around the country, but what does it entail? Pyorrhea is essentially gum disease, usually in a more advanced stage. So, what is the official pyorrhea definition? The term pyorrhea was formerly used as a catch-all for gum disease, but when it’s used now, it also refers to a more advanced stage of gum disease. Now that we have a definition of sorts, it’s time to examine what signs of pyorrhea/periodontitis to look out for and the symptoms you may experience in relation to the disease. When you are affected by pyorrhea, a number of signs and symptoms may indicate a visit to the dentist is in order sooner rather than later. The gums around your teeth are often tender to the touch or when brushing. They can also be visibly red. When you brush your teeth, your gums will likely bleed. You may also notice blood on the floss when flossing your teeth. Your gums will appear as they are pulling away from your teeth. Due to infection, bacteria, and the various causes of gum disease, there’s a good chance you will have bad breath that doesn’t seem to go away despite brushing, flossing, mouthwash, etc. You may find pus leaking from your gums from the root of the tooth area. Between receding gums and pus build up, teeth may become loose and even feel like they are shifting. If you are experiencing some or most of these symptoms, there is a very solid chance you have periodontitis (pyorrhea). Before you can treat the gum disease, however, you may want to know what is causing it in the first place. You’ve seen the symptoms of pyorrhea/periodontitis pop up in your mouth. It’s kind of gross, especially if one of the symptoms is pus coming from your teeth. How did this happen? For the most part, pyorrhea is linked to bad dental hygiene. 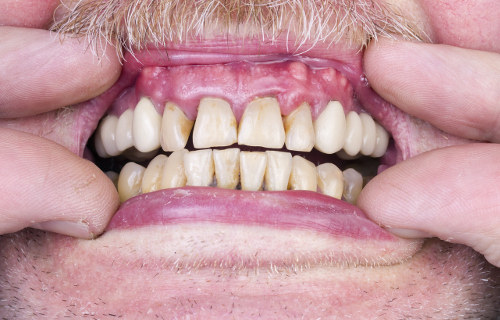 Gum disease occurs due to plaque buildup and food particles trapped along the gum lines. This buildup becomes a breeding ground for various bacteria, which can then cause gum disease. Pyorrhea occurs when the gum disease becomes very severe. At this point, it may begin to cause problems with teeth and bone. Other issues that may lead to periodontitis can include things like injury. Bad gashes resulting from improper use of toothpicks or dental floss or an accidental slip of a fork or knife can leave the gums wide open for an infection that can turn into pyorrhea. The state of your dental work may also play a factor in pyorrhea. Cracked and broken fillings or crowns and bridges that never sat quite right can leave food particles trapped where they are not supposed to be. Misplaced food and plaque buildup around the gums can go on to cause gum disease and pyorrhea. This may be a little overwhelming at first, especially when you see the severity of the symptoms, but don’t lose hope. Pyorrhea can be dealt with, and there are a number of home remedies that may help you tackle the problem head on. Periodontitis can be a scary thing to wrap your head around. Very few of us want to lose teeth or encounter severe gum and tooth damage that can result from periodontitis. Luckily, there are ways that you can treat it, and many of those involve simple home remedies that can be made in the kitchen or the bathroom. The following remedies may help you clean out the periodontitis from your mouth. The best home remedy of all is to never have to deal with it in the first place. While some causes of periodontitis may be unavoidable, others can be taken care of with good daily oral hygiene. Brush your teeth properly and regularly, floss, and make regular visits to the dentist for cleanings. These simple steps can go a long way. Used for a variety of mouth conditions, a salt water rinse can help clean out your mouth and help with gum disease due to the salt’s antibacterial properties. Two tablespoons of salt in one glass of lukewarm water may make a difference. It works best if you swish the rinse around for one minute and repeat the process two or three times a day. Unrefined coconut oil can also be used as a rinse. Take a mouthful of coconut oil and swish it around your mouth for 15 minutes before you brush your teeth. Spit it out and then commence brushing your teeth. One of the simplest and easiest remedies for periodontitis is to take a fresh, tender guava leaf and chew on it. The leaf can help physically remove the plaque, while the contents of the leaf may help deal with periodontitis due to guava’s healing and antibacterial properties. Periodontitis sounds intimidating, but as you can see from the above points, it can easily be relieved. If you think you have pyorrhea, the first step is to make an appointment with your dentist. But in the meantime, you may find that the home remedies that we included can help you clean up the mess before you sit back in the dentist’s chair. “Pyorrhea: What it is – What causes it – What to do about it,” Ora MD, http://www.oramd.com/pyorrhea-its-causes-and-treatment/, last accessed April 10, 2017. “Pyorrhea,” Groton Wellness, http://www.grotonwellness.com/practices/dental-orthodontics/health-focused-or-biological-dentistry/dental-conditions/pyorrhea/, last accessed April 10, 2017. “8 Best Home Remedy for Pyorrhea (Pus in Gums),” Home Cure, http://home-cure.net/home-remedy-pyorrhea-pus-gums/, last accessed April 10, 2017. “Home Remedies for Periodontitis (Pyorrhea),” Top Ten Home Remedies, http://www.top10homeremedies.com/home-remedies/home-remedies-periodontitis-pyorrhea.html, last accessed April 10, 2017.